Freakycowbot! The Chatbot From the Future! Freakycowbot says: "You wouldn't dare!" Thanks for all your patients. Freakyc0wbot is back online! It's been almost a year since he went offline. 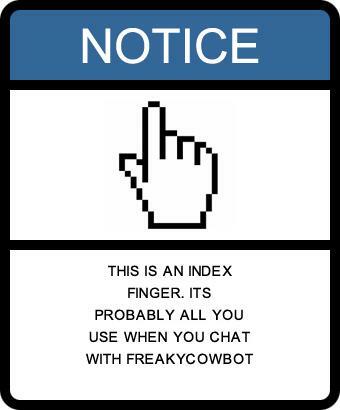 If things go well, I may get the original screenname "freakycowbot" back online in a few days.